DURING the 2014 independence campaign I led over 100 “Better Together” volunteers in an area of Edinburgh which is home to tens of thousands of people. Over that summer each volunteer I trained was told that our message was that a No vote was about securing more powers for Holyrood. This was the vow we made on literally thousands of doorsteps. Eighteen months later it is now clear that that vow has been delivered with the negotiations on the Fiscal Framework reaching a successful conclusion. As Nicola Sturgeon said in Holyrood yesterday “this deal will ensure that funding for Scotland will not be changed without the Scottish Government’s agreement”. This is what Scotland voted for in 2014. The SNP’s role is ironic given the financial ruin that would have come with their preferred referendum outcome, an outcome which no independent fiscal analysis has shown would be in Scotland’s interests. We cannot, however, let more powers and fiscal agreements be the end point of Scotland’s political enlightenment. The SNP have shown themselves to be a timid government which is happy to tinker at the edges of the problems Scotland faces and manage gradual decline. It’s now time for the political class in Scotland to put their constitutional differences aside and draw up bold plans for Scotland’s future. Let’s talk less about the 1707 Act of Union and more about using Holyrood’s newly won powers to ensure health, education and welfare in Scotland is fit for the 21st century. The Conservatives are highly effective political operators yet even they are invariably outsmarted by the SNP. Though perhaps not this time? George Osborne, by effectively caving in over the fiscal framework, gives the SNP largely what it demands. Nicola Sturgeon is able to boast in Holyrood that she’s “won”. If Scotland’s tax yield falters or our population grows slower than the rest of the UK, Scots will be grateful the financial safety net provided by Westminster persists. But what will be the impact on the Nationalist’s principal raison d’etre – independence? Devolution is the last thing Nicola Sturgeon wants. She justifiably fears increasing numbers of us realising Scotland now has a decent deal that’s rendered relatively risk free by our still being part of the UK. The forthcoming Scotland Act, and accompanying fiscal framework, gives Scots the right to expect the SNP’s relentless games of them and us with Westminster to take a back seat in favour of a focus on policy. After a year of protracted negotiations, the SNP have finally agreed a deal on the fiscal arrangements for the Scotland Bill to proceed but they are now in a real dilemma as to what to moan about next as they are running out of options. Perhaps they could focus their whingeing on the underfunding of local authorities in Scotland but that could well backfire and come back and bite them. When we find that Alexis Tsipras, the spendthrift prime minister of bailed-out Greece, is now in a position to judge on Britain’s status within the EU, the time has surely come to call it a day, and be rid of this madness. There are 3.5 million UK jobs dependent on the EU, 10 per cent of our workforce. There is freedom for British citizens to travel, live, work, study and retire in any EU country. There has been an unprecedented period of peace in Europe. And a long time ago, the UK opted out of the euro, EU banking union, Schengen agreement on borders, defence policy etc. The EU is not perfect, it needs to be reformed, its immigration policies reviewed, and there should be more focus on jobs and growth. But exiting would mean that in the things that matter – jobs, workers’ rights, growth, trade, security – we would be worse off. All put at risk because the Conservative Party of David Cameron and Ruth Davidson is involved in a civil war. David Cameron’s decision to call a referendum to placate part of his party risks causing untold damage to this our prosperity. At present I feel that the EU debate is being influenced by individual MPs, the emphasis being on whether they back David Cameron or not. There is very little factual information in order that the ordinary man or woman in the street can make an informed choice and vote accordingly. Your editorial comment rightly highlights the benefits of a EU-wide response to many of the security threats we face in the today’s uncertain world (Global threats require a joint response, 23 February). Indeed, there are many critical aspects of the challenges that face us that are best approached in a close partnership with our European neighbours. Others that come readily to mind are competing effectively in global markets and addressing the impact of environmental damage. The UK economy is not only very dependent on Europe as a market for our goods and services, but also benefits enormously from investment from across the world by companies targeting Europe as a whole. Setting ourselves apart from the EU endangers one of the prime attractions of the UK economy and doing business with us. On two consecutive days The Scotsman has published letters from Ian McElroy (Letters 23 February) and John Milne (Letters 24 February) both perpetuating the myth that “Project Fear” was a term coined by the SNP. Mr Milne says that this term was “devised and shamelessly employed”. In one respect he is correct, but this term came from within the staff of Better Together and was how they chose to style their method of campaigning. And it worked. Project Fear? As Basil Fawlty would say “Don’t mention the going rate for a barrel of North Sea Brent Crude!” Or would that be Alex Salmond? 1 – Scotland should be an independent state. 2 – Scotland currently is not treated as an independent state with regard to issue X (currently the EU referendum, but has been oil revenues, taxation, immigration policy etc). 3 – This is unfair, because Scotland should be an independent state. 4 – Therefore Scotland should become an independent state. The circularity of the argument is as plain as the nose on Nicola Sturgeon’s face, but it seems to routinely pass unchallenged and unnoticed. In 1795, 18 months before his death, Scotland’s Bard, Robert Burns, joined the Royal Dumfries Volunteers, formed that year to defend Britain against the fear of invasion by France. “Be Britain still to Britain true, amang oursels united! 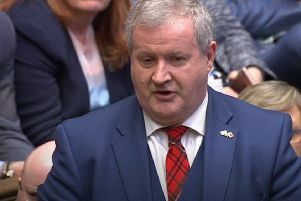 One wonders what Burns would have thought of today’s wrangling, with Ms Sturgeon and the Nationalists who, despite the will of the two million people who voted against them, are doggedly determined to break up the Britain he so patriotically defended. Polar bears are a conservation success story. In the 1960s the polar bear population was hunted until there were only about 5,000 left but the current official estimate is now about 25,000 but could be 27,000 to 32,000. This is good news but there seems to be a reluctance by the climate change brigade to rejoice since it does not fit in with their climate alarmism. When the next Ice Age comes, in the not-too-distant future, then polar bears will survive as they have done for tens of thousands of years but the human race, dependent on wind turbines, will freeze to death. If you are a tourist or visitor to Sutherland make sure you carry plenty of notes because the banks are few and far between. In Bonar Bridge and Helmsdale they operate on one day for five hours, in Lairg two days and Dornoch three days. The banks will tell you the reason is that customers are changing their way of banking and using the internet. That is fine if you have a computer and secondly if you can get internet access. You will note that banks have started closing down at an alarming rate but have they followed the British Banking Protocol from May 2015? This is being investigated by the Financial Ombudsman Service and the Financial Conduct Authority. The protocol is due to be reviewed in May 2016. Now that the Scottish Parliament has reached maturity it would seem the appropriate time to put away childish things. Could I suggest the first of these to go would be the puerile clapping by the SNP (you’ve guessed it) for the SNP!